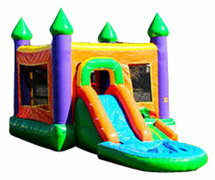 Austin Metro Moonwalks offers top quality inflatable Bounce House Rentals. This particular inflatable includes a slide that can be used wet or dry, and the pool itself can be removed to be used for a dry slide and/or party. This particular combo is great for younger ages and smaller children as the bounce house and slide are a bit smaller than the rest of our combo rentals. Nonetheless, this particular bounce house combo is guaranteed to keep the kids busy for hours. All of our moonwalks are properly cleaned and sanitized before each party to ensure that your kids not only have a fun and exciting time, but a safe one at that.